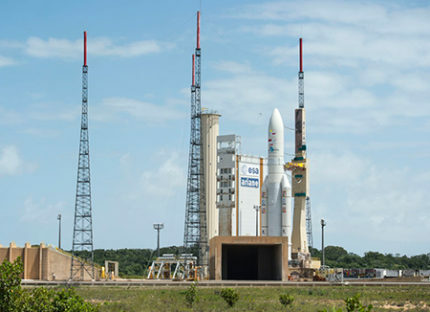 Arianespace has rolled out the Ariane 5 for its initial heavy-lift mission in 2017, scheduled for tomorrow evening from the Spaceport in French Guiana to orbit the SKY Brasil-1 and Telkom 3S satellites. 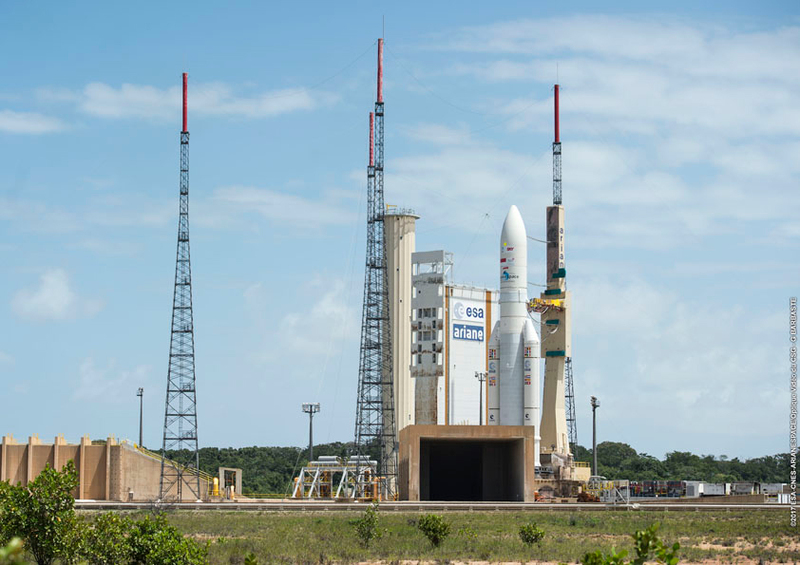 This Ariane 5 was transferred today from the Spaceport’s Final Assembly Building to the ELA-3 launch zone, readying it for departure during a launch window that opens at 6:39 p.m. in French Guiana (21h39 UTC). The two passengers are to be deployed into geostationary transfer orbit. The Ariane 5 for Arianespace Flight VA235 moves into position at the Spaceport’s ELA-3 launch zone. SKY Brasil-1 is located in the launcher’s upper payload position, and will be released first during the flight. 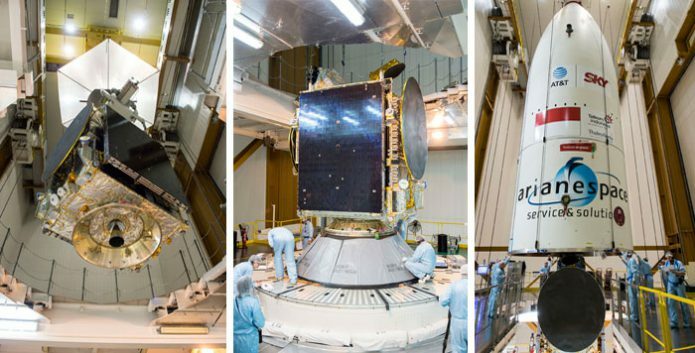 Developed for utilization by AT&T/DIRECTV via its DIRECTV Latin America subsidiary, the 6,000-kg.-class satellite is to expand direct-to-home high-definition programming for Brazil. It was produced by Airbus Defence and Space in Toulouse, France, using the spacecraft manufacturer’s Eurostar E3000 platform. Riding in the lower payload slot, Telkom 3S will be deployed at just under 40 minutes after Ariane 5’s liftoff. This 3,550-kg. relay platform was designed for the delivery of high-definition television services, as well as mobile communications and Internet applications for Telkom Indonesia – providing coverage over Indonesia and Southeast Asia. It will be orbited in the framework of a turnkey contract with Thales Alenia Space, which produced it at Toulouse and Cannes, France, based on the Spacebus 4000B2 platform. Tomorrow’s launch, designated Flight VA235 in Arianespace’s launcher family numbering system, is one of up to 12 Spaceport missions planned this year with Arianespace’s heavy-lift Ariane 5, medium-lift Soyuz and lightweight Vega.